We headed offshore with 5 clients on Saturday morning, July 25th. By 7 am we had found a monster-sized kelp paddy and right away hooked up on a nice yellowtail to get the skunk off the boat for the day. Like the last few mornings we got into the jumping tuna offshore, but unlike those other days, this time they wanted to stay in one place and wanted to eat sardines…not just feathers being trolled right into the frenzy. 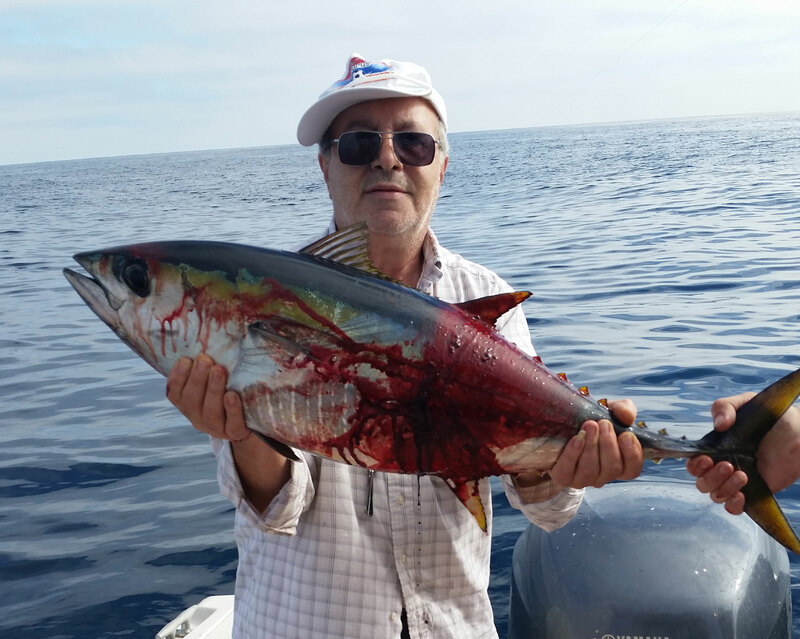 Within minutes we got the uncle of the group hooked up on a nice yellowfin tuna, and he landed it 15 minutes later. Those fish moved on, so we did too. I decided to set up 3 trolling rigs with bright feathers – that was the ticket the day before. After about an hour of trolling I looked back and randomly saw one of the rods bent and barely bobbing, but the clicker wasn’t screaming out. I hollered at the guys on the bow to grab the rod, and glanced back again to see a really small dorado hooked up and jumping to keep up with the boat. The client grabbed the rod and begins to reel and it pops off. He immediately grabbed the other trolling rod to crank it in and then all hell broke loose! 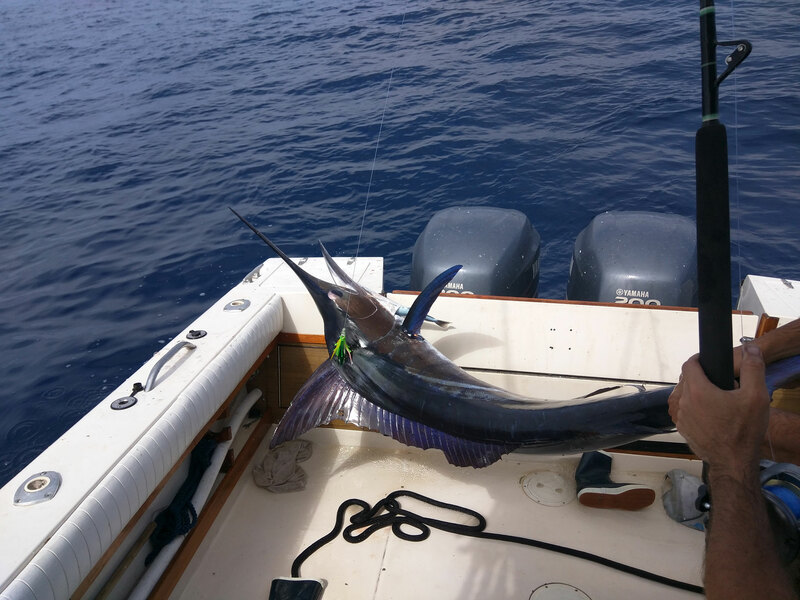 We had it next to the boat 5 times, before it would begin spooling the reel again. We’d chase it down with the boat, and repeat the process. After about an hour and a half we had it tired out, got it along the starboard side and got a rope around the tail and the celebration began! Cognac out of the bottle, high fives, hugs and tears all around. 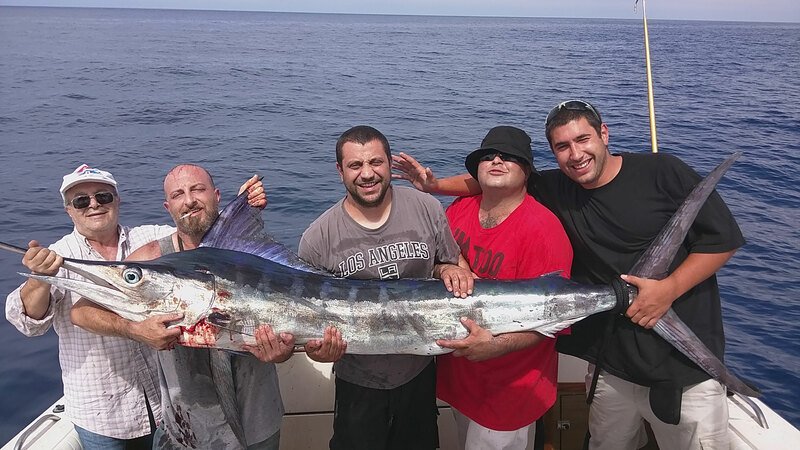 Harry Gasabyan, the client who reeled the fish in had been dreaming of catching a marlin for 20 years, so for me to have the chance to help him make his dream come true was really special. We headed for home after that catch since the fish wouldn’t fit in our 5′ long kill bag, and I wanted to ice it up completely. All of the scales in Point Loma were closed or non-operational at that time, so we loaded the fish up in the truck in an ‘ice jacuzzi’ and headed to Mission Bay to get it on the crane there. 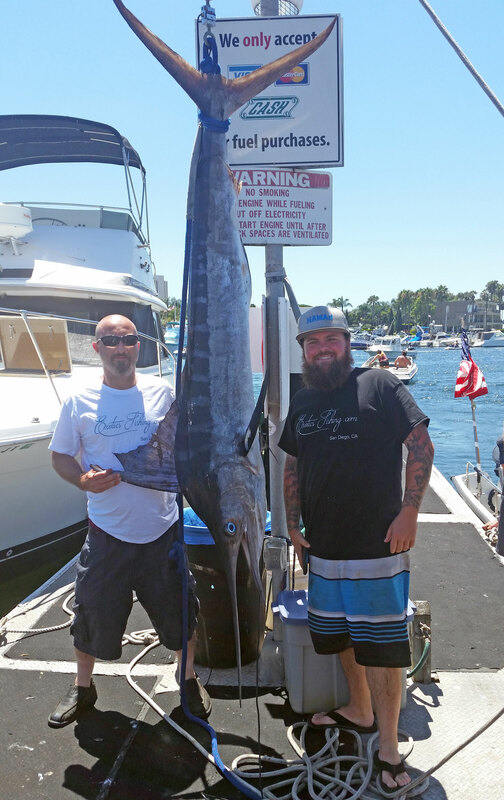 The fish went 95 pounds bled, and measured a little over 8′ in length. We did happen to have a GoPro onboard and captured some amazing underwater footage of the fish next to the boat and taking off on some of those runs. The video is being edited, so I will post it up when it is done. Overall, this is one of the best and most rewarding days in my fishing career. I hope everyone is enjoying this once-in-a-lifetime summer as much as we are! Nutty that this was killed! My last Mexico trip we caught one and the damn thing wouldn’t revive after the long fight. You should have seen the heads of the crew hung low on the way into the harbor. They get Preservation! We don’t get it yet out here of the Cal coast yet. So sad! 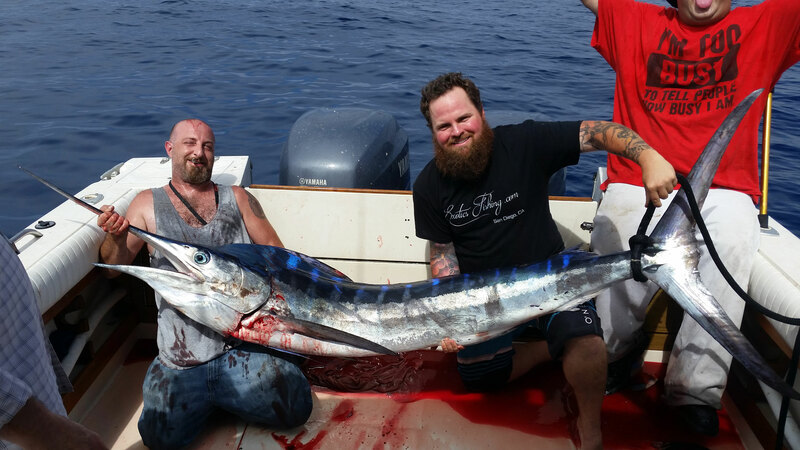 Of course everyone’s quick to jump on why we didn’t release it…It was gut hooked and bleeding out like crazy by the time we got it to the boat. As far as what gear we were using it was 60 lb izor line and we had to chase it with the boat the entire time Kurt V D Linde. Happy fishing everyone! !